Truly, what could be better than waking up to mountain views, surrounded by fresh air and gorgeous pine trees? Doing it all in a luxurious log cabin style dream home. Uniquely blending modern luxury with rustic charm, 273 Bluebird Terrace is the perfect home for those looking to reconnect with nature without sacrificing modern amenities. Discover what this incredible home can offer you today! Perhaps one of the best perks of this home are the views. 273 Bluebird Terrace is gorgeously designed to make the most of its location. Built on over an acre of land, enjoy a sense of secluded tranquility and peacefulness that let you make the most of wooded surroundings. 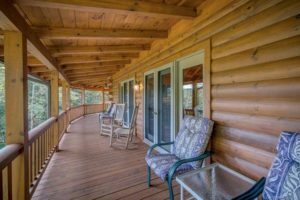 Featuring custom windows that allow you to see the mountains and the lake, this home also offers a covered porch for soaking in the sights during the hot summer days. Make memories of stargazing and roasting marshmallows over an open flame at the fire pit outside. Reconnect with nature without compromising modern conveniences and luxuries at 273 Bluebird Terrace. 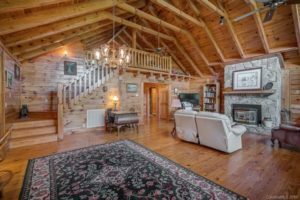 This home included a generously sized fireplace that dominates the living room, adding even more rustic charm. The spacious kitchen included stainless steel and new appliances, making it easy to whip up a quick snack, or cater a four course meal for any amount of guests. The master bedroom is highly desirable with a private viewing balcony, perfect for spending a quiet morning drinking coffee. This home truly blends the best of nature with modern luxury. Apart from the views and amenities, 273 Bluebird Terrace also offers an unparalleled location. Go hiking in the mountains, swimming in the lake, or explore local restaurants and shops within moments from your front door. Known for its active residents, the Lake Lure community offers countless opportunities to love where you live with countless events put on throughout the year. The fun doesn’t stop during winter living here! 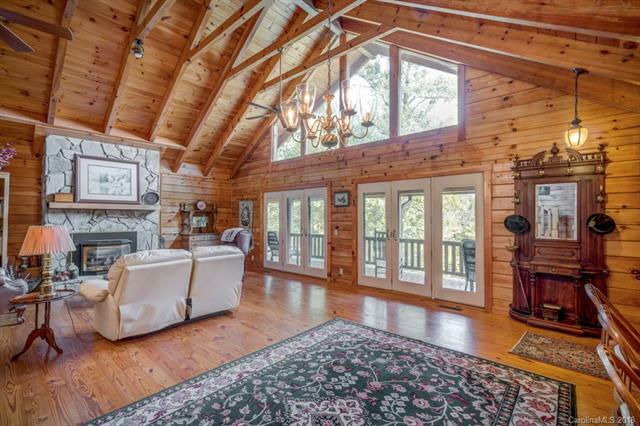 With incredible nature views, incredible amenities, and an unbeatable location, this listing won’t last long! Schedule a tour with me today! Give us a call today to learn more about homes available in Western Carolina.